Shortlist of candidates for New Zealand role | A blog about smart POS software for independent small businesses. It has been hard work but we have finally got to a shortlist of candidates for our New Zealand Business Development Manager role to be based out of Auckland. We received applications from candidates with excellent skills and experience and have taken time to consider all as we developed our shortlist. As part of our company giving program, we are thrilled to have been able to help a community owned business install our system at below cost. The package included a considerable amout of hardware, a week of time on site and our software. The community group works with people who might otherwise not be able to find work. In the organisation they are able to develop careers of which they can be proud. The Tower Systems jeweller management software provides access to a suite of jeweller-specific reports developed in consultation with jewellers and their business managers. These reports present information the information jewellers want in a format they want. While our jeweller software includes a host of general retail business performance reports, it is the jeweller specific reports that help jewellers better understand their businesses from their unique retail channel perspective. What enhances the value of our jeweller software is the continued improvement of the software to serve evolving needs of jewellers. Every few months the software is enhanced without any cost for jewellers covered by the Tower AdvantageTM service. Whether it is fast seller tracking to location specific performance reporting to repairs management, the jeweller reporting tools better inform jewellers of the performance of their business through data they have identified as being mission critical. Our help desk team is careful about information they share about our software, especially when talking about secure and fraud-prone parts of the software and the fraud detection tools we have. As we have noted here previously, we require written authority to provide some advice. This must be signed by an identified business owner and provided to us before we provide the advice. We have heard of a retail employee getting information from a help desk which was later used to defraud the owner of the retail business – an expensive mistake which could have been avoided. We don’t publicly publish some advice sheets in an effort to ensure that sensitive information and information that could be used against a business from getting into the wrong hands. We train all of our people on this to protect the interests and rights of our customers – the owners of the retail businesses where our software is used. The considerable investment we made recently in a new whole of business CRM solution is paying off. Our help desk team is able to note details of support calls more quickly and in a way that is accessible to our customers than with our previous software. This is saving us time on the help desk and this helps customers. Each week we further tweak the CRM software based on experiences, further settling it into our business to deliver the operational and customer experience benefits we want. Our customers are loving the certain follow up contact after every call to the help desk. this provides a communication trail as well as confirmation of what was covered. Our leadership position in the Australian newsagency channel has been on show over recent months as we have offered free access to our Newsagency of the Future workshop. This two-hour workshop explores the health of the channel, considers international retail trends and offers newsagents some thoughts on a road ahead. The workshop has already been attended by hundreds of newsagents, some Tower customers and some not. The feedback has been wonderful as newsagents have engaged with the suggestions offered during the session. This was certainly a goal from the considerable investment on behalf of newsagents – to get them engaged proactively in their own future. Tower Systems serves in excess of 1,800 newsagents and provides access to what is judged to be the industry standard newsagency software. How much should it cost to purchase a POS system for your retail business? Purchasing a Point of Sale software system for a retail business should involve a thorough assessment of the costs associated with the system as well as the functionality and suitability for your retail business needs. Sometimes, sadly, retailers purchase on price, chasing a cheap solution. Buying on price is risky as what is cheap today may not be cheap tomorrow, not when you take into account costs which may not have been disclosed. Most businesses should be able to purchase a Point of Sale hardware and software solution for a few dollars a day. This is the best way to consider the cost regardless of whether you fund the purchase through leasing or not. What is the purchase price of the software and what sort of licence is provided for this. For example, some systems come with a one-year use licence. What training is included in the price and for what time? What support is included in the price and for what time? What software updates are included in the price and for what time? What will be the on-going software support fee and is this mandatory? Will access to the software be blocked if I do not pay the software support fee? Are software support charges the same for all users of your software? If the retail business is sold what is provided to the new owner in terms of training? Is there a transfer fee? Not all POS software companies charge the same prices and not the same to all customers. Do your homework and assess the total cost of ownership over three or four years. This stock file checking is a service we offer for any supplier supplying our customers. Since we took over the NewsPOS business in April, we have been in close and regular contact with newsagents using the NewsPOS software. In an hour, we host our first NewsPOS user meeting in brisbane where we will meet with NewsPOS suers, talk about the software and discuss plans for the future. Those who can;lt be at the meeting will be part of the conversation through other means. When we took over the business we were clear in our commitment to the software and offering support and other assistance. What we will deliver in an hour is us fulfilling a promise. Our bike shop management software helps bike shop owners to stay in tough with bike customers through several means. The most immediate and valuable contact is through post sales follow-up emails and or letters to offer customers the opportunity to return for a service or some other form of check up. Thanks to the marketing tools in our bike shop management software it is easy for bike shop owners and managers to send follow up emails and mail to recent customers. They can create a target database based on a range of criteria collected by our software. Being able to sift through customer data to create a marketing database makes it easy for the business to send activity and purchase specific follow up communications. This, in turn, helps bike shops grow sales through add-on purchases. This is another way our bike shop management software is paying for itself in the many bike shops using it across Australia and New Zealand. Each training workshop will be live and interactive. The sessions are designed for people using our software. This is why we make them accessible from any PC so that employees can access the training from home and in their own time. For years Tower Systems has offered a free retail business health check service to retailers using its Point of Sale software. This service provides an independent perspective of the performance of the business and how the software is being used in the business. In addition to suggestions on business growth opportunities reflected in the business data, the retail business health check considers efficiency opportunities – to help retailers using the Tower software to get more from their IT investment. Tower is well positioned to provide this advice and share the insights because of its many years owning and operating hits won retail businesses. There has been a surge in 2012 in retailers wanting to participate in the retail business health check service thanks to good word of mouth from others who have engaged. All information provided by and to participating retailers is confidential. This is customer service beyond what us usual for a Point of Sale software company. It takes the relationship between Tower Systems and participating retail businesses to a new level, delivering a value from the relationship way beyond the traditional software help desk relationship. The results of the service alone can free cash and or drive revenue to easily pay for the entire system investment. Tower Systems is very proud of the point of difference of the free retail business health check service. Almost two weeks ago we announced to our retail management software customers a special hardware upgrade offer in the run up to the end of the financial year. SUPPORT BONUS. For each $5,000 you spend we will credit supported users with an extra month of Tower Advantage software support for the location being upgraded. Spend $8,000 and you get two months … and so on. NO PAYMENTS FOR TWO MONTHS. Thanks to Flexirent your first two payments are on them. Ask us for details. INSTALLATION DISCOUNT. Our usual rate of installing new hardware is $770 (inc. GST) a day. Order by June 30, 2012 and this is cut to $550 (inc. GST) for a day. In this package of benefits we are giving to our customers rewards for their support of us. Hardware upgrade sales through us mean one place to call for an IT query, hardware they can trust, installation by software experts. One reason we have not increased software support fees for four years is the hardware upgrade business we achieve. Data matching and other programs around taxation compliance are resulting in more retailers being audited by the Australian Taxation Office. An audit can be daunting to a retailer as they are often asked for data which they to not access in the day to day operation of their business. Easy access to the required data, in a form acceptable to the ATO, is vital to a successful audit outcome. Tower Systems helps retailers using its Point of Sale software to navigate and respond to an audit by the ATO in a number of ways. We guide the reporting of business data, answer ATO questions as to the chain of custody of the business data and provide assistance to our customers through the process. By working with our customers and helping them efficiency access accurate information for the ATO, audits can be seen off quickly andy with a good outcome for our customers. This help is part of our Tower AdvantageTM service. We are seeking candidates for a Business Development Manager role in New Zealand to sultanate and manage strategic roles with New Zealand retailers who could benefit from our retail management software. Advertised on Seek (NZ) a week ago, we already have an excellent pool of candidates to consider. We are seeking someone with an affinity with and understanding of small business and retail. Our in-house creative team has been working on a complete replacement of the marketing collateral used to promote our software in trade journals, brochures and at trade shows. The first airing of the new collateral will come in Gift and Homewares industry publication Giftrap with this advertisement. 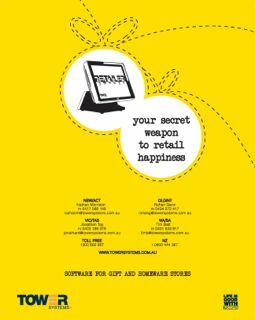 This ad is a tease of a broader collateral package representing our retail management software. We are using colours and visual themes which are very current for the age range we are targeting with our marketing. Too often software companies create advertising which looks like word art from twenty years ago. Our in-house team is showing off their skill by professional representing Tower in a fresh, visual accessible and creative way … like our software. XchangeIT, the magazine distributor owned EDI platform, reports to newsagency software companies regularly on compliance of newsagents using the respective software packages. The reports cover all newsagents using the software. This reporting is structured and the same for each of the software companies. By covering all users both XchangeIT and the software companies are able to see the compliance of full user communities. At Tower Systems we review the regular compliance reports and engage with newsagents who are not meeting the requirements and therefore face financial penalty from XchangeIT. We follow up the reports with calls, emails and offers of additional training and other assistance to help Tower newsagents comply and enjoy the benefits of complying with the EDI standards of the newsagency channel. The lack of compliance usually comes down to a process mistake being made. Our people help identify this and provide training to these responsible so that they can meet compliance requirements. The news reports of retailers in trouble are bad enough. The commentary suggesting a broader retail problem is more worrying. While there is no doubt that some retail channels are doing it tough, there are other retail channels enjoying success and plenty of retailers enjoying success. All of us in retail need to shin lights on the success stories to get the attention of the commentators and their editors who seem to think that stories of dark clouds around retail attract readers. 100% of our revenue comes from retailers. We will end the 2012 financial year with a wonderful sales increase on FY 2011. Retailers are investing in their businesses. Every day we hear success stories. Many success stories we hear are from small and independent retailers, business owners who are active in their local shop, managing their business with a focus on a genuine local point of difference. We are thrilled to be part of some of these success stories. While the media will continue to report retail bad news, we will continue to live success in selling to retailers and through them the success they achieve in their retail businesses. Tower Systems sells Point of Sale software to retailers in a range of retail channels including: garden centres, jewellers, bike retailers, newsagents, homewares shops, gift shops and bookshops. The company serves in excess of 2,500 retailers in Australia, New Zealand and several other countries. Specialists in Tower Systems have been called as experts in cases of employee theft. Sometimes these cases have been heard in courts which take almost a day of travel to get to. By the time we get through the deposition, committal hearing and trial processes we can be out many days of time in the pursuit of justice around alleged criminal behaviour. The disruption to our business of this activity is considerable yet we accept it as part of our role as experts in the area of employee theft. We get drawn into this work around tracking, catching and prosecuting in relation to suspected employee theft. We have structured process to our investigative work and this is why police and prosecutors like to work with us. Thanks to strong theft tracking and management tools in our retail management software, retailers are able to exert more control over this considerable business risk. We offer training, documentation and support to help mitigate the theft risk. Despite our work and warnings, we are frustrated the more retailers do not make use of the tools and services at their fingertips. If they did this we could see ourselves spending less time assisting police and prosecutors. Catching theft activity early is a win for all involved. The end of shift process for retailers using retail management software is as important as the process of physically closing and locking the retail shop. Counting the takings, checking records and preparing the float for the next shift are all important steps. Our retail management software provides certainty for the end of shift process. We follow a structured process, providing anyone undertaking the process with guidance without the need for complex training. In addition to bringing the retail trading data to a close from a data and cash balancing perspective, the end of shift process also takes care of internal housekeeping as well as sharing data with external parties as determined by the business owner in the setup of the software. The structure we provide externally and under the hood provides certainty to our retail business partners. It gives our customers certainty on which they can rely. Several members of our Point of Sale software help desk team are out in the field today at a busy retail business undertaking a whole store stock take and getting first-hand experience using our software in an important function for which they will provide advice to our customers over the next couple of months. It’s the second stock take we have undertaken recently. It’s part of our internal training in the lead up to the end of the financial year. There is no doubt that having this personal experience will better inform the stock take and other end of financial year advice provided to our customers by help desk team members. It is actions like this in the field training which sets our services apart. We are fascinated by the money supermarket giants Woolworths and Coles are spending in their latest price and loyalty war. Each is trying to outdo the other with their claims of discounts and loyal shopper benefits. Smart shoppers who price and service compare an independently owned retail business with Coles or Woolworths will often find that the independent retailer offers better value, value in the form of price, service, social responsibility and even respected brand range. Small and independent retailers and the lifeblood of the Australian economy and they are our customers here at Tower Systems. We recently compared prices charged by some retailers using our Point of sale software with nearby major supermarkets. Yes, our customers were cheaper on everyday items despite the advertising by the supermarkets. Australian consumers need to look beyond the advertising campaigns and check for themselves. Often, the genuine value offered by a business is the inverse of what it spends in advertising its claimed value proposition. We support our community of small and independent retailers by delivering retail management software while helps them to operate efficiently, transact accurately, order with reduced waste, reward loyal shoppers and manage employees for business growth and personal reward. We help small and independent retailers compete in an economy dominated by large retailers. Thanks to smart tools in our software, our retail partners can communicate the benefits of their business through several touch points during and after sales processed by our system. By empowering small and independent retailers with outcome-focused competitive tools, oyr partners can bank terrific results. Tower Systems is acquiring the POSIMS software business from Chris den Hollander. POSIMS is well known for its garden centre software. The much-respected POSIMS software serves a loyal community of garden centres as well as several other retail niches and has offered quality software backed by friendly and professional support for many years, serving a loyal customer base. Under the terms of the business purchase, Tower Systems will assume full responsibility for the POSIMS software and customer service from over the next few weeks. The acquisition by Tower Systems extends its garden centre market share, pushing its customer numbers in this channel to more than 70 locations. The company is committed to continued software development to facilitate natural growth in this channel. The Tower software serves garden centres in the retail management, stock control, theft management, customer loyalty, supplier integration and marketing areas. POSIMS customers can switch to the tower Windows software with the benefit of data transfer. Users of the POSIMS software are welcome to contact Chris den Hollander on 02 4934 2683 or Mark Fletcher on on 0418 321 338. Once the hand over has been completed Tower Systems will email and fax help desk contact details to all POSIMS customers. Our newspaper distribution and home delivery software continues to evolve to meet the changing needs of newspaper distribution businesses in a rapidly changing marketplace. The latest changes are being developed with a couple of businesses leading the consolidation. Thanks to our early moves in the newspaper distribution space, we make it easy for businesses to operate a distribution centre and connect to payment points for providing customer-facing services. The next round of software enhancements for distribution newsagents will be released in a few weeks following thorough work by our QA team. Each training workshop will be live and interactive and delivered completely online. The sessions are designed for people using our software. This is why we make them accessible from any PC so that employees can access the training from home and in their own time.